The Model 80 Fence Post Driver is designed for the commercial fence builder particularly game fencing. It can handle up to 16' tall posts and is side-shift capable to drive down the fence line. Mounts on 65 H.P. or better tractor. Handles up to 16' wood, cedar posts, pipe or t-posts. Side shift for speed and efficiency. Center balanced and simple design. U. S. standard replaceable wear parts for user friendliness. Efficiency. Labor and time saver. Standardized three point hook up. Mountable on conventional tractors, as well as skid steers utilizing a heavy duty skid steer adapter. Break-over 16' for easy travel and moving. Receiver hitch for attaching a trailer load of post. Free standing while not attached to tractor or skid steer. Years of research and development went into the first Black Cat Post Pounder models. Back the early days the Black Cat Post Pounder found its way into a recognized market of commercial fence builders as well as end users in the likes of independent ranchers, cattlemen, property owners and livestock and game managers. Over the years the Black Cat Post Pounder has proven itself for other markets also, including being used for security fencing, game fencing, highway guard rail contractors, and building contractors. We have seen our post drivers mounted on barges for pier, docks and bulkhead installations. One customer mounted our unit on a Snow King to be used to build snow barriers for the building up of snow for a ski resort. Today, the Black Cat Post Pounder has active users in 31 of the 50 United States. We have shipped post drivers to Mexico and South America, including Uruguay. If you are interested in purchasing the Black Cat Post Pounder, hopefully its success will speak for itself. The cable over hydraulic system technology we incorporate into our fence post drivers has proven itself to be successful and effective, with some of our original machines from back in 1999 still in active service today. 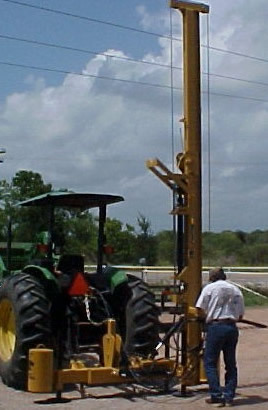 The beauty of our simplistic system is utilizing a hydraulic cylinder to accelerate lifting a drop weight by cable through a series of pulleys and having the ability to control the drop impact onto a post to affectively drive it into virgin ground to a desired depth without damaging the post. The drop weight does not hit the post directly but hits a beam guided pounding cap that controls the top of the post. The operator has control by the use of a hydraulic control handle of how often and how hard to hit the post to drive it to the depth he or she wants. A safety feature is made note of that if the operator hand slips off the handle, the drop weight will stop in mid-air. The beam that the drop weight rides up and down also is utilized to align the post. There is typically a window of opportunity (up to 24 inches) to align the post. If the post tends to go crooked, the operator can simply line it back up with the beam and keep pounding. Lessening labor costs which have increased profit margins for commercial fence builders. Mast Length Length of the main beam from ground to the top of device. 10' 0" or 16' 0" 16' 0"
Pounder Weight The weight of the pounder. 550 lbs. 550 lbs. Shipping Weight Approximate shipping weight. 1400 lbs. 2400 lbs.